Our range of fiberglass road plates and covers are made from modern composite materials. They are lightweight and easier to handle than traditional steel road plates. 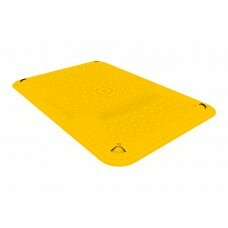 They have an anti-slip surface and are highly visible. There are several types of these plates available, each with their own application within a construction site. Our light duty pedestrian sidewalk cover for use on sidewalk and pedestrian areas. Made from High visibility HDPE and capable of withstanding loads of up to 881lbs. Ideal for covering site excavations and ground works for utility services. Alternative to Steel Road Plates to withstand up to 96800 lbs in weight. Ideal for use on main roads where all types of traffic pass. These modular reinforced fiberglass plates can be used for cover utility trenches. The 15/5 road plates are designed for easy manual installation. The LowPro is a lower value Sidewalk Plate for use in pedestrian areas only, it can take a maximum load of 553lbs. Its small size, bright color, and rubberized edges minimize trip risks. As these road plates are made almost entirely from non-metallic materials there is no incentive for metal thieves to steal them. Theft of metallic objects for scrap is becoming more and more of an issue with current metal prices. The textured surface low profile edges and high visibility color of our road plates makes them far more pedestrian friendly, reducing the risk of slipping and tripping. Traditional steel road plates do not always lie flat on the roads surface, this makes them very noisy when traffic passes over them. The modular road plate 15/5 with its interlocking design is stable, and far quieter under heavy traffic than steel plates. Need assistance in choosing the right road plate? Our technical sales team are here to help! - Call our designated support team at (800) 671-9662 or drop us an email.